Last April work sent me to London, so of course I had to make an extended visit to the Liberty of London store and then make a beeline to the top two floors where all the glorious fabric is sold. Bolts and bolts of fabric goodness. Budget and luggage limitations forced me to limit my choices to just a couple of fabric designs. Choosing took waaaay longer than it should have. Down on the first floor of the store were all kinds of beautiful silk scarves. Only, the cheapest ones were about USD $300. Too expensive. I lamented that to the lady who was helping me and she said that many people come into the store and buy silk by the meter and hem the raw edges to make their own scarves. (She also said that her stash of Liberty fabric at home was even greater than that in the store. Be still my envious heart.) With a meter of silk selling for about USD$54 that sounded like a bargain to me. [Price is always relative. $54 for a meter of silk?!] 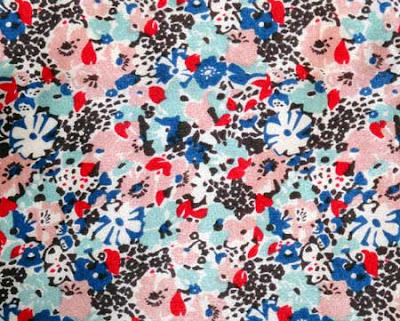 So I chose two silk fabrics; one of which is shown below. Which is why nine months later I have finally gotten around to hemming the raw edges after getting over my fear of handling silk. Since a meter of silk ended up being about 42" by 54" I was able to make two scarves: one a 42" square and the other one 12" x 42". So happy. Work needs to send me to London again.